The course of south Indian history from pre-historic times to the contemporary era is a complex narrative with many interpretations. 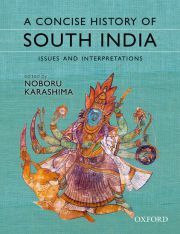 Reflecting recent advances in the study of the region, this volume provides an assessment of the events and socio-cultural development of south India through a comprehensive analysis of its historical trajectory. Investigating the region's states and configurations, this book covers a wide range of topics that include the origins of the early inhabitants, formation of the ancient kingdoms, advancement of agriculture, new religious movements based on bhakti and consolidation of centralized states in the medieval period. It further explores the growth of industries in relation to the development of East-West maritime trade in the Indian Ocean as well as the wave of Islamicization and the course of commercial relations with various European countries. The book then goes on to discuss the advent of early-modern state rule, impact of the raiyatwari system introduced by the British, debates about whether the region's economy developed or deteriorated during the eighteenth century, decline of matriliny in Kerala, emergence of the Dravidian Movement and the intertwining of politics with contemporary popular culture. Well illustrated with maps and images and incorporating new archaeological evidence and historiography, this volume presents new perspectives on a gamut of issues relating to communities, languages and cultures of a macro-region that continues to fascinate scholars and readers alike.